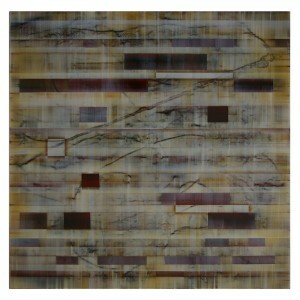 Exquisite premiere contemporary abstract painting from 2008. The deepest essence of this painting is colour, light and their relationship with the world of experiences. A painting can never offer final solutions. It can only suggest, by posing questions that are formulated to challenge. is the name of the challenge. The intimate theme of Secret is the moment preceding dawning light that makes the landscape, colours and air shimmer in an immaterial way. Seeing the light spread across the horizon, with the experience reinforced by the awareness that it connects everything in rhythm. The enclosed forms of colour create a narrative proceeding in the direction of the pictorial plane. The essential point of its rhythm is the way in which each form meets the ones next to it, above or below. Tonal ranges near each other resonate lyrically, while, for instance, the gestural opposition of black, sienna and ochre create dramatic contrast. The rectangular shapes of colour can thus be seen as events, which even the smallest deviation from the vertical and horizontal will make a shape active or passive. The forms float in a space of veils and gestures in direct frontal view, lending itself to the illusion of a stage; the stage of light and moment in pre-dawn light.